Looking for answers? Below is an FAQ that will hopefully answer most of your questions. Simply click our frequently asked questions to read the answers. Didn't find what you were looking for, please visit our support page or feel free to call our friendly customer service team on 1300 306 604. 1. Will I be able to use the OHS/WHS System in my state? Yes. SafetyCulture Systems comply with current legislation in all States and Territories. 2. Do these systems comply with AS4801 legislation? The content of our OHS/WHS Management Systems has been aligned with key elements from AS/NZS 4801, OHSAS 18001 and the Work Health and Safety Act & Regulations 2011. 3. Do these systems/plans meet the CM3 accreditation? 4. What if the legislation changes? Regular emails are sent out to our database of clients to keep them informed about any updates or changes to the documents. At SafetyCulture we like to help you keep up to date - for any documents already purchased, you will only ever pay an upgrade fee. 1. Can I view a sample OHS/WHS System? Yes, we are happy to provide an example documents from our WHS/OHS Systems. 2. I am tendering for a council/government tender. What do I need? One of our Occupational/Work Health and Safety Management Systems will meet the OHS/WHS requirements of the tender along with the relevant Safe Work Method Statements (SWMS) to cover your scope of work. 3. Do your systems/plans contain SWMS? No, this is because each business/organisation perform different tasks and have different equipment. Our systems do contain a blank SWMS template for your customisation. 4. What is the "Date / Revision Date" of my document? 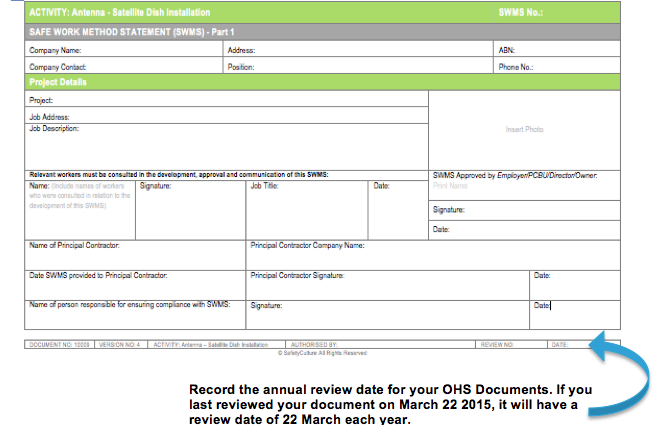 The "Revision Date" or "Date" included in the footer space of your document is a date that your organisation sets to assist with the annual review process of your OHS compliance documents. OHS Documents should be reviewed at least annually, in consultation with workers, health and safety representatives and other relevant parties. 1. Can I add my logo and company name? Yes. All documents are provided in Microsoft Word Format, so you can easily input your company logo and details. 2. Can I change the content of the WHS/OHS System? 1. How long will it take to receive my documents? Your purchased products will be emailed to you directly upon receipt of payment from our online store and normally takes no more 30 minutes minutes. 2. How do I download my purchased products? All our documents are emailed upon payment, in MS Word format, ready for you to download, save and edit as required. A download link to all your purchased products is included in your Sales Tax Invoice. 3. Do you post it out or send out a disk? No, the document is provided via email ready for you to download and customise, so you can use it for multiple jobs. 1. Is my Work Health and Safety Management System accredited? 2. How do I gain accreditation for my workplace health and safety management system? Implement the system into your business. Ensure that all elements of the system have been filled in and that relevant checklists, registers or forms are completed when required. Secondly organise to have a third party accredited auditor conduct an audit of the implemented system against the standards criteria. The auditor will then at their discretion award accreditation. When seeking accreditation, organise the auditing company to supply you with a pre-audit checklist so that you can ensure you meet the audit criteria prior to their visit.